Performers include: Jim Jefferies, Dan Bakkedahl, DJ Qualls, Mindy Sterling, John Ratzenberger, and Sonya Eddy. Jim Jefferies (playing a fictional version of himself) is an edgy and foul-mouthed stand-up comedian from Australia. He’s in his mid-thirties and is living in Los Angeles, struggling to make his life and career more “legit.” He finds that it’s a difficult, uncomfortable and uphill struggle — every step of the way. Jim is encouraged in his quest by his neurotic best friend and roommate, Steve Nugent (Dan Bakkedahl) — a cyberlaw library salesman who struggles to stay on his feet in the wake of a divorce. He’s also supported by Steve’s brother, Billy (DJ Qualls), who suffers from advanced staged Muscular Dystrophy and is confined to a wheelchair. Other characters include Steve and Billy’s parents, Janice and Walter Nugent (Mindy Sterling and John Ratzenberger), and Billy’s nurse, Ramona (Sonya Eddy). What do you think? Do you like the Legit TV series? Do you think it should have been cancelled or renewed for a third season? Super bummer. Great characters in this show. Why do all the good ones get cancelled and the dumb **** gets 13 – 100 seasons! Family Guy was canceled after 3 seasons and after a 2 year pause its racked up another 10 seasons and is still going. Just goes to show you that TV execs don’t always make the right choices. 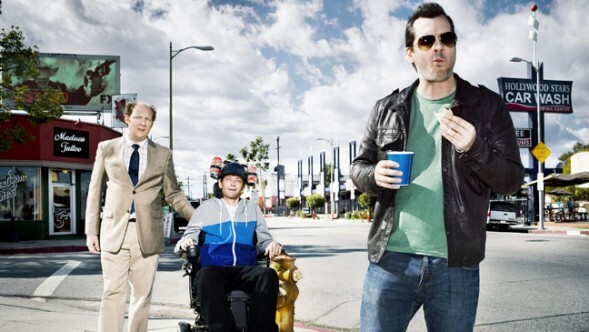 Hopefully this series will get picked up again, its a funny show and I also enjoy Jim Jefferies comedy style. It’s funny you say that because I’ve been saying the same thing! I get the feeling that these LA TV execs are so coked up, shallow and incapable of recognizing quality that they couldn’t make a proper decision if they were given only one choice! Well, let’s keep our fingers crossed that “Legit” pulls a family guy. I don’t know why Netflix just doesn’t start producing it.